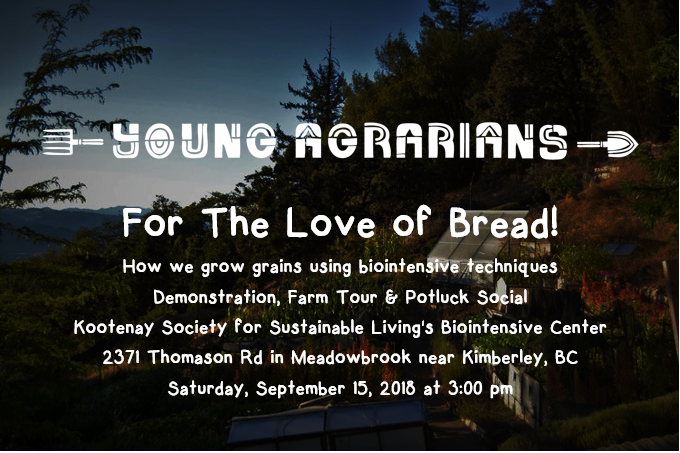 The Kootenay Society for Sustainable Living is teaming up with the Young Agrarians to host an event: For the Love of Bread! We'll start with a tour of our Research & Demonstration mini-farm, then dive in to a mini-workshop focused on how we grow grains using the Grow Biointensive method. Following the tour and workshop we'll be hosting a potluck dinner, including sourdough bread made from grains grown on site! Please check out the Young Agrarians website for more event info, and follow the event on Facebook for updates!